The Kunoichi of Destiny. A legendary figure has been transformed into a figma! 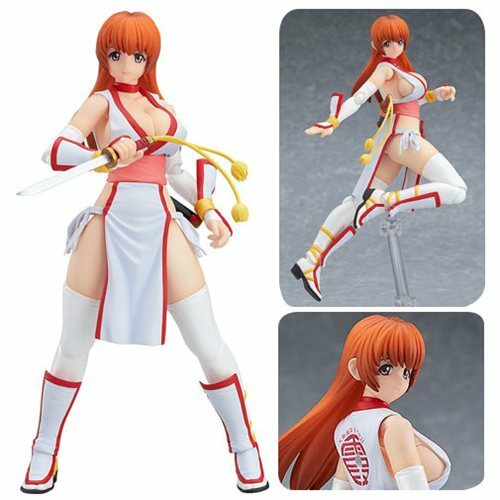 Taken from the 3D fighting game Dead or Alive, this 5 3/10-inch tall Dead or Alive Kasumi C2 Version Figma Action Figure is based on the classic Kasumi C2 version 1:6 scale figure. Using the smooth yet posable joints of figma, you can act out a variety of different scenes, and the flexible plastic used for important areas allows proportions to be maintained without compromising poseability. Kasumi brings two face plates: a gentle smiling expression and an expressionless face similar to the scale figure. Her short sword is included and can be displayed both drawn and sheathed, and a special alternate body part lets you completely recreate the original pose from the scale figure! There's also an articulated figma stand.